Would you throw money on the floor? A serious question now, would you throw money onto the floor? You may be mistaken in thinking that Twistfix have gone completely crackers! However, it is an honest question and we want to make the point that so many homeowners are throwing money away because they have inadequate roofing insulation. Insulating your roof is obviously beneficial but it can also help the environment and most importantly cut down your energy bills resulting in huge savings. If you do not have your roof insulated then it is important you do so as soon as possible and Twistfix can help you with this. Over the winter period and especially over Christmas time many homeowners will put their central heating on high in order to stay toasty and warm. Obviously heat rises and so without sufficient insulation much of the heat will escape through the roof and thus the money you plough in to pay for central heating is lost! Many people have a layer of insulation laid on the floor of their roof attic space. The insulation values can be greatly increased by installing an effective secondary layer of foil insulation at rafter level. .
Not only should homeowners be thinking about roof insulation but business owners should do too! Comfortable working environments for your employees will result in increased productivity whilst saving you money on energy bills. Our BRE certified reflective foil insulation is great for reducing heat loss via infra-red reflective surfaces. This highly effective foil insulation works by having two highly reflective layers of aluminium foil which is separated by an air film bubble centre. What is also important to consider is that unlike other roofing insulation methods the EcoFlex foil insulation is free from CFC/HCFC and has zero ozone depletion potential. In addition to insulating your roof though it actually acts as a vapour barrier having low emissivity air spaces to enhance thermal performance. Twistfix have a whole range of roof insulation products and another one of our favourites is the loft insulation spray foam. This is an expanding foam which is applied to loft spaces beneath the roof tiles in order to seal off airleaks, helping to insulate existing structures. 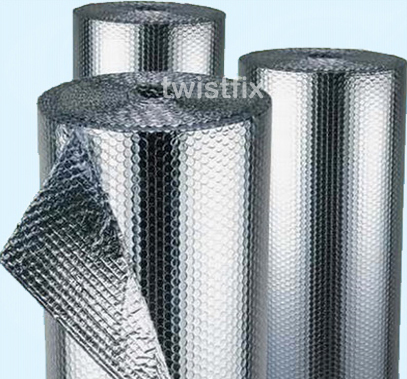 For more information about these fantastic roof insulation products and for help on how Twistfix can stop you throwing money away this Christmas contact us on 0845 1236007 or email sales@twistfix.co.uk.